On Sunday evening the Los Angeles Lakers play the Philadelphia 76ers, both of which have been struggling along without their top players. The game is set to be a close one with almost identical betting odds available on both teams. The Lakers are slight favourites with odds of 5/6 but the 76ers aren’t far behind at 1/1. The Lakers will be trying to with back-to-back games for the first time in almost a month while the 76ers will be trying to avoid their third loss in a row. 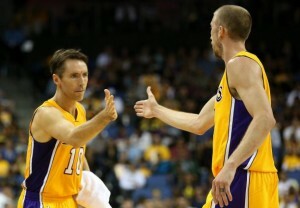 The Lakers are without Steve Nash and Steve Blake due to injuries; Nash has only played in two games due to a broken leg, but is expected back in practice next week. The 76ers are missing Jrue Holiday due to a sprained right foot. While Holiday could play, coach Doug Collins said that he doesn’t “want him out there playing on one foot and getting back spasms or something”.